Coca Cola presents “Swelter Stopper” as Secret Ingredient number 11 in a television commercial bringing together a range of cartoon cultures. Two fiery monsters wreak havoc on a sweltering city but put aside their differences to enjoy a cold, refreshing Coca-Cola. 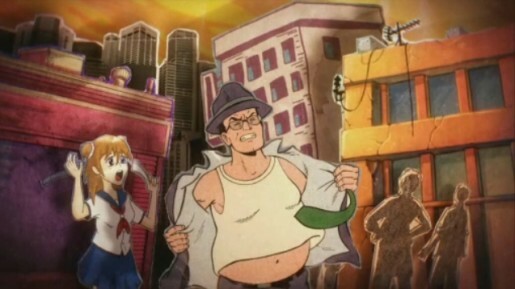 Two hot and bothered comic monsters fight it out in a sweltering city scene. It’s time for Superman and Sailor Moon to do their thing – but it’s just too hot. Finally one of the monsters discovers a lorry full of Coke, leading to a relatively happy and chilled out ending. The commercial is an animated collage of different comic styles from Manga to Marvel, but according to Tom & Mark, the directing team behind the commercial, trying to create a look that could have been made by cutting up a stack of old comic books isn’t as simple as it seems. With a tight schedule and a ton of artwork to create the brothers immersed themselves in the design stage of the project, creating endless creature possibilities before settling on our two hero characters. Tom and Mark worked together with comic book artists to create character designs with a truly authentic comic book look and much of the fun was in this design process. Each element was animated individually with each scene assembled in layers to show depth and shadows of the elements. The animation varies from smooth and stylish to slightly clunky and raw to give the spot the effect of having been created from individual comic book frames. The Swelter Stopper is part of the Secret Ingredient campaign developed at Wieden + Kennedy Portland by creative directors Hal Curtis and Sheena Brady, copywriter Tatum Shaw, art director Ken Meyer and agency producer Jessica Staples. Animation was directed by Tom & Mark (brothers Tom and Mark Perrett) at Nexus Productions with executive producer Julia Parfitt and producer Pip Malone. Sound was mixed at 750mph, London, by sound engineer Gary Walker and producer Syleste Molyneaux.